Dry ice is solid carbon dioxide (CO2). It has the unusual property of 'subliming', that is going from a solid to a gas without passing through a liquid phase and this is how it gets the name dry ice. The product can only exist at -79C and it maintains this temperature by sublimation. In the UK the CO2 in dry ice is from a recycled source and so is not making a contribution to global warming. Liquid Carbon Dioxide (CO2) is the source of all dry ice products. The liquid is stored at 20 bar and around -20C. It is released through a nozzle to 1 bar at which point dry ice 'snow' is created. This snow is compressed and extruded at around 1500 psi to form pellets, slices and blocks of dry ice. The CO2 used is food grade and is non-toxic, it is the same chemical that gives drinks their fizz. Dry ice density is around 1.6 g/cm3, however the bulk density is around 1g/cm3 just like water. The CO2 gas occupies about 800 times the volume that the dry ice did! CO2 gas is heavier than air and will sink to low areas and displace air. At elevated concentrations CO2 can be fatal as an asphyxiant. Provided the safety guidelines are followed dry ice is safe - we ask that our customers follow the BCGA guidelines as a condition of sale. Please read our dry ice safety and guideline advice for further information. When dry ice is added to warm water a dense white fog is immediately generated.The white fog is an aerosol of tiny water droplets just like fog created naturally. What's happening is that the very cold dry ice is subliming from solid to the gaseous phase and bubbling through the water. In so doing the CO2 gas leaves the water container which has a substantial amount of moist air above it. The cold CO2 gas condenses water molecules in the air above the container leading to the formation of tiny water droplets which are so small they stay in suspension with the gas. The only difference between natural fog and dry ice fog is the presence of gaseous CO2 interspersed with the water droplets. CO2 gas is heavier than air and so tends to carry the white fog towards ground level creating cool effects! The fog will cover the ground, roll down stairs, and swirl when walked through. It will not rise into light beams like glycol type foggers and will not make a fine mist in the air like hazers. Dry ice fog has no odour, contains no chemicals, and leaves no oily residue. Consider using a fog generator - the next question "How is a dry ice fogger operated?" If you are looking to cover a large area, such as a dance floor, you will need 20kg of dry ice which will last for 8-10 minutes. Add dry ice to a container with hot water (50C) and the fog effect will be spontaneous. The fog effect can be halted if too much dry ice has been added to the water so chilling (and ultimately freezing) the water and reducing the humidity of the air above the container. To maximise the fog effect you need to use warm/hot water. If you want the fog effect to last for a prolonged period consider adding a source of heat to keep the water warm - the container could be a rice cooker or slow cooker on the lowest heat setting. Be careful - if you use the heater on a high setting thermal currents will send the fog into the air spoiling the effect. Candles will not work as the CO2 will extinguish the flame, after all CO2 is used in fire extinguishers! You can place orders for dry ice packs and blocks on-line at www.chillistick.com. Our standard delivery days are Tuesday to Friday. For special requests, Saturday delivery and other quantities, please phone us on 020 3432 9412. Dry ice should never be placed into the mouth or swallowed. So as a rule dry ice should never be added to drinks to avoid any such risk. However, Sublime Products have created a new product called Chillistick which allows dry ice to be added to drinks providing a safety barrier between the drinker and the dry ice so creating great smoking effects whilst enjoying a drink safely. When dry ice is loaded into the Chillistick a majority of the gas will bubble to the surface and create the much-loved mist. A small amount of gas will dissolve into the liquid to create carbonic acid and effectively carbonate the beverage though not enough to cause any fizzing. The slight carbonation effect is enough to tingle the tongue and give a slightly bitter taste as found in popular soda waters. Ironically dry ice does not mix well with carbonated soft drinks or beer. The vigorous bubbling action will substantially un-carbonate the beverage leaving the drink 'flat'. Chillisticks are therefore best used with non-carbonated cocktails and fruit drinks, punches etc. Dry ice will chill drinks and because it sublimes will not dilute drinks as does conventional water ice. It is cold enough to chill beverages without the use of ice. Hence dry ice will not water down or dilute drinks. The mist effect varies depending on the temperature of the beverage. The colder the liquid the slower the dry ice will be dissolved see our section on fogging. A hot beverage can produce spectacular results as the dry ice is rapidly dissolved. Typically the mist effect can last 3 to 5 minutes. For presenting small items such as cakes, food and beverages our small 4kg pack is ideal.Please note that if you are looking for a subtle effect to enhance a food/wine presentation less is definitely more! If you wish to create a couple of large smoke effects for your guests then you will need the 10kg pack, and if you have a large space and want to create something memorable multiples of this are worth considering. As a rough guide 20kg of dry ice will produce between eight to ten minutes of fog and create a thick fog carpet. If you would like further information please do not hesitate to contact the team on 020 3432 9412. To check that the ice has been secured in the chillistick the rounded end of the stirrer rod will be engaged by the valve and it will be possible to hold the entire assembly by the stirrer rod. Pull out the stirrer rod and use. You can prepare chilllisticks up to 45 minutes prior to serve and in this case keep the loaded chillistick in the dry ice box. With practice it is possible to load the chillistick in about 5 - 10 seconds. 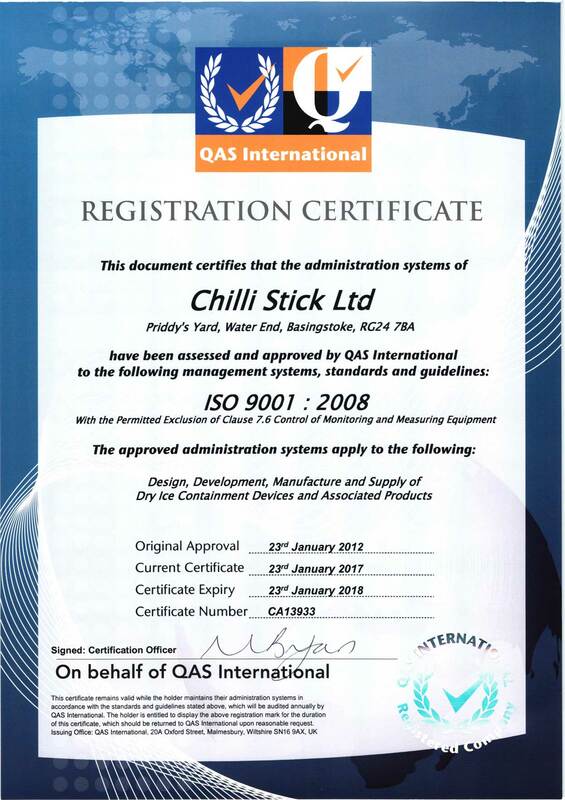 Please watch the Chillistick Instruction Video.